Stems: Erect, reddish brown, branched above, mostly glabrous, often waxy. Leaves: Opposite, simple, short-stalked or sessile, ascending to erect, lanceolate-oblong to ovate-oblong, .75 to 6 inches long, .25 to 2.5 inches wide, glabrous above, sparsely hairy and pale below; margins entire; tips pointed or rounded, terminating in short, flexible points. Flowers: Small, erect or drooping; calyx lobes 5, lanceolate, glabrous; corollas bell-shaped, white to greenish white; petals 5, less than 1/5 inch long, united; stamens 5. Fruits: Pods, slender, 2 to 8 inches long, straight or curved, borne in pairs, drooping or spreading; seeds numerous, reddish brown, tufted with silky hairs at tips. Habitat: Open disturbed sites, waste areas, stream banks, pond edges, and moist lowlands, most abundant on sandy or gravelly soils. Toxicity: Indian hemp dogbane is highly poisonous, but livestock rarely consume it because the bitter, milky sap makes it very unpalatable. Uses: Native Americans used the stem fibers to make thread, cord, bowstrings, and fishing nets. Native Americans and pioneers utilized parts of the plant to create laxatives, cardiac stimulants, respiratory aids, cough medicines, and to make a tea to treat internal parasites. Comments: This rhizomatous weed forms colonies and can seriously affect crop yields. 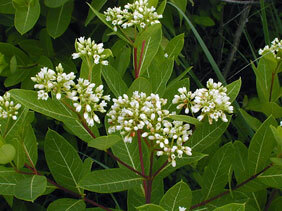 The common name "dogbane" is in reference to the plant being poisonous to dogs.